Released September 23!! Read an excerpt below. The Bradys chatted, sipping their morning coffee at the kitchen table. When we breezed into the living room, neither blinked an eye at our unusual entrance. But then again, it wasn’t so unusual to them. Layne’s human parents had been aware of his dual life for much longer than I.
Mrs. Brady met us in the kitchen door. “Son, it’s good to see you. And, Lynzi, honey, we’re so glad you decided to come along.” She was busy with her own brand of multi- tasking. After hugging the two of us, she hurried back to retrieve coffee mugs for us and to tend to some other cooking she had going on the stove. “Y’all come on in and have a seat, son. Lynzi gal, it is good to see you again. Mama just made a batch of fried apple pies here. Y’all help yourselves now.” Mr. Brady gestured to the platter piled high with the homemade turnovers. “Lake told me about the trouble y’all are having. What else can you tell us, Daddy?” Layne asked between bites. Concern, as well as the aroma of warm apples and cinnamon, hung heavy in the air. “We’ve lost more than two dozen cows in the last week alone, son. That newest bunch of yearlings we moved over to your place is gone, too. Lake had cut out all his young bulls to take to auction next week, now they’re all dead. Looks like wild animal kills to me. Massive-sized animals. The cows’ throats were ripped out with one bite.” Mr. Brady studied the coffee in his mug and shook his head. “I’m sure you’ve already run this by Tom. What was his take on it?” Layne’s brow knit closer together. His expression echoed his daddy’s pain now that we had heard how serious the matter had become. “Well, Mama, she actually heard stories about the cats living in the area from her granddaddy when she was a little girl. He was the only one who ever got a good look at them. He spotted ‘em several times on the edge of the fields he was plowing but since no one else ever saw much more than a blur, they weren’t sure what that movement was. I confirmed her granddaddy’s stories and filled in the other facts about Tom and his family.” Layne reached for my hand and winked. “It wasn’t a huge surprise after I revealed my life to her. And believe me, I learned real fast to be open and upfront about everything. She’s a bit of a wildcat herself if she thinks I’m keeping secrets . . . or if someone threatens her family. I call her my little Lynx.” Layne smiled and leaned down, planting a kiss on the top of my head. 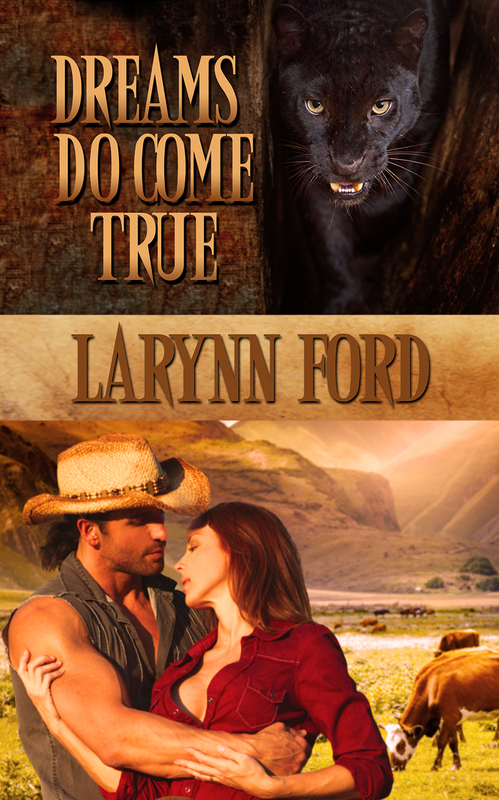 Click the Dreams Do Come True cover on the right to purchase.